Super Start to Rock n Roll San Diego Half Marathon Training! I’ve made a weekly workout/running chart for myself on this new training cycle. 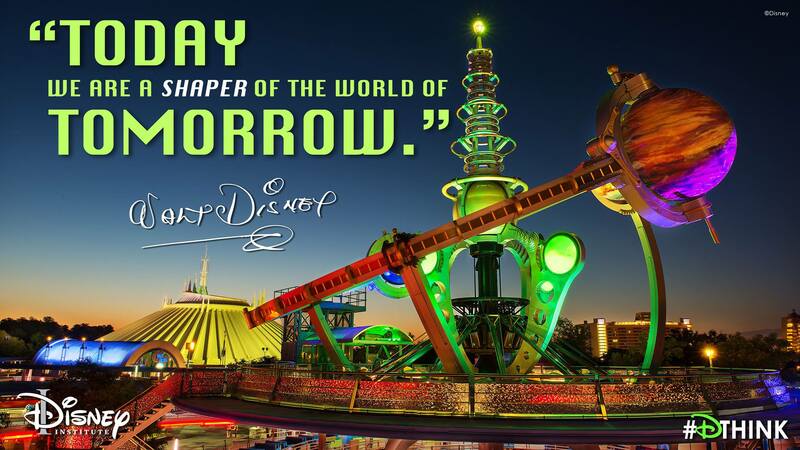 In the chart, I’ve decided to throw up some inspiration for week. This is the graphic I used for week number 1 of my 2017 Rock n Roll San Diego Half Marathon training cycle. I think that I’ll try and start my weekly recaps with the graphic I’ve chosen for each week. It might be kind of fun. 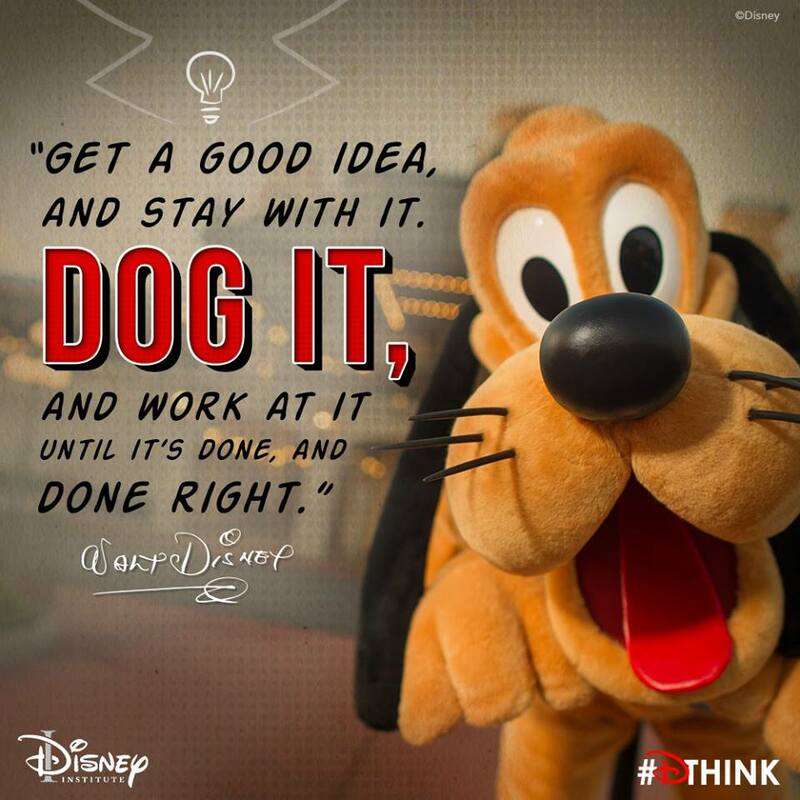 I picked this one because it seemed like a good one for building foundations for an outcome we hope to achieve later on. To say that I was excited to begin a new season, a new chapter, of my running life is an understatement. I can’t explain it, but everything feels new again! This week has been everything a week 1 should be in any training cycle ever! It totally set me up for future success! On Tuesday, I got out for run number 1 of this training cycle. I’ve still been feeling the effects from this nasty cold. So, I decided it would be a good idea to keep my intervals and pacing easy. I ran the same run 25 seconds, walk 95 seconds intervals as I ran the Tuesday before. My focus this week was to build a solid foundation for a training cycle success. That’s what this run was all about. Since it was my first run, it really didn’t matter that the run be as fast as I eventually want to go. I enjoyed every minute of this 4 miles! The intervals felt exactly right and I felt really good by the end of the run. So, I call this run a total success. Yes, my time was slow, but I had lots of fun putting in 4 miles! As you can see in the splits, I ran a pretty consistent first 2 miles. I was a little faster in mile 3 and slower in mile 4. That’s the way it went. Thursday’s run was much better and faster at the same time! I used the exact same intervals as Tuesday, but shaved 34 seconds off my time! This run was a rather fascinating one for me. As I started the run, my intention was to use the run 25 seconds, walk 95 seconds intervals in miles 1 and 4. I’d switch to a run 20 seconds, walk 40 seconds for miles 2 and 3. As I was in mile 1, I had this epiphany. In training cycles past, I was so worried about getting to a running pace that I needed to be in for a race, that I’d work really hard to get there quickly. This time around, I’m wanting to work on patience. I’ve got 17 weeks to prepare for this race. So, I don’t have to be race ready right in week 1. It’s okay in week 1 to be slow and build from there. So, by the time I got to the end of mile 1, I decided not to switch my intervals and just keep the same intervals going for the first two weeks of this training cycle. It was a hard decision to make because I ran mile 1 faster than on Tuesday. That usually encourages me to make switches to my run/walk intervals. As I ran through mile 2, something dawned on me. One year ago, I was starting this same cycle in preparation for the 2016 Rock n Roll San Diego Half Marathon. 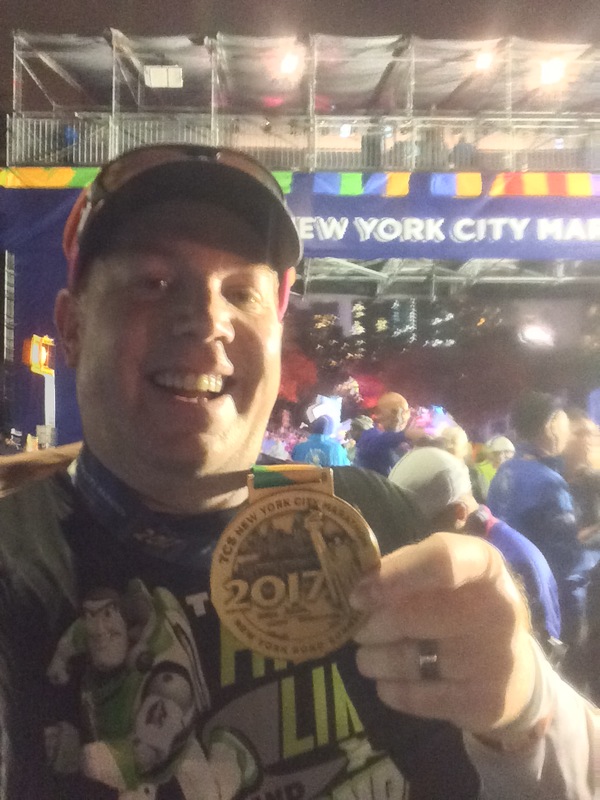 By the start of March, I had come up with the plan to go from training for the 2016 Rock n Roll San Diego Half Marathon through the 2016 TCS New York City Marathon. So, it’s kind of like I’m getting a “do over” in 2017! In addition to this realization, I also had a really interesting thing to see along the way in mile 3. As I ran by a Cheesecake Factory here in Pasadena, I noticed that it had been roped off by the police and no one was in the restaurant. Later, I would find out that a bomb had gone off in the kitchen that night. Crazy! At the end of the run, I was thrilled with my time. As you see in the splits, I was ahead of my pace in each mile except for mile 2. Knowing that I had a chance to beat my time, with the same intervals, from Tuesday was all the motivation I needed to keep the pace good throughout the entire run! On Saturday I faced my shortest “long run” weekend run that I’ll have for the entire cycle. In the past, I’d take advantage and try to shorten walk breaks or increase run intervals for a fast finish. This time, I stayed true to my decision to keep the run/walk intervals consistent and be patient. It was great to be out and running around the Rose Bowl again! I love being out there among so many runners! As has been the case, my pacing got quicker (even with the same intervals) throughout. Of course, this was a different route than what I ran on Tuesday and Thursday. The intervals I was running was something I’ve been getting comfortable with. 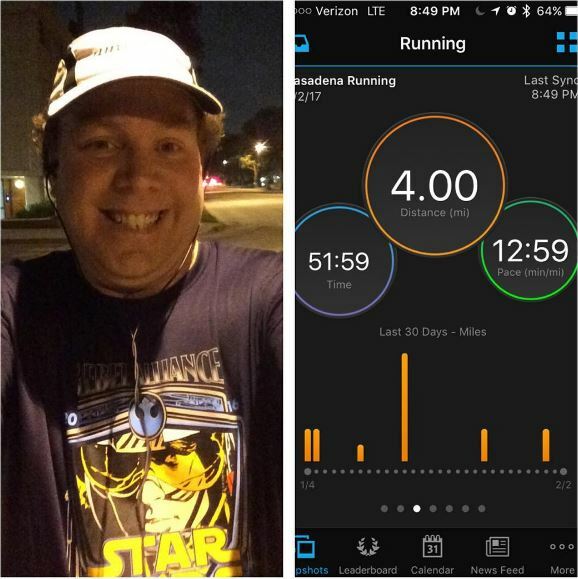 I used the same intervals in the Star Wars Half Marathon – Light Side in January. Now, I know that I can be faster than I was on Saturday. However, I was totally okay with how slow it was. I kept telling myself that I’m building a foundation for this training cycle. So, keep going and don’t worry about the finish time. As I look over the splits from all three runs, I’ve noticed a fun trend that my times are getting quicker. I know that there will be a limit to how quick I can finish any distance with the same intervals. For now, it was very encouraging to see the times improve with each and every run. On Sunday, I did something I haven’t done in quite some time. I finished my 4th workout of the week at the gym! There is a gym schedule I’ve come with for myself. Back when I was training for the 2015 Los Angeles Marathon, I used the same kind of thing and it helped me greatly. What I’ll be doing is pretty simple. I’m starting off at the treadmill doing 400’s. For this week and the next two weeks, I’ll be doing 4 x 400. I did some research and found that I want to run my 400’s at 2:43. What does that look like on the treadmill? Somewhere around 5.5mph. So, on the treadmill, I ran 4 x 400’s at 5.5mph on Sunday. The time it took to finish each 400 was 2:40. So, I’m pretty close. My hope is that, after 3 weeks of doing 4 x 400 on the treadmill, I’ll be ready to run a 4 x 400 on the track (like I have on my training schedule). Next up (for Sunday) was time with the assisted chin ups and dips machine. 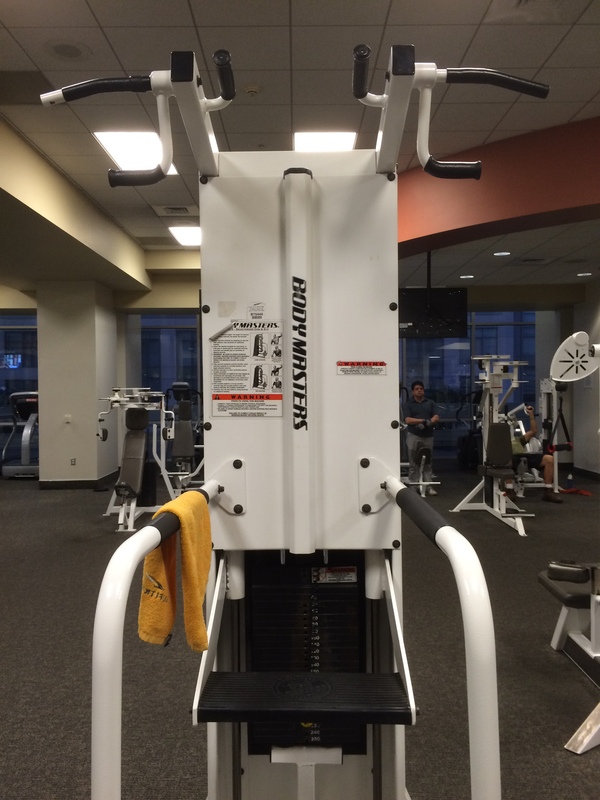 This machine helps those of us who can’t to regular chin ups and dips. The weight takes weight off your body weight. So, unlike most machines, the goal is to use less weight as you progress. I’ve started off at using 220lbs. I do 3 sets of 15 reps for chin ups and dips (3 sets each). This worked out famously for me. I think this is the perfect starting point for myself. Next, I used the abdominal crunch machine. 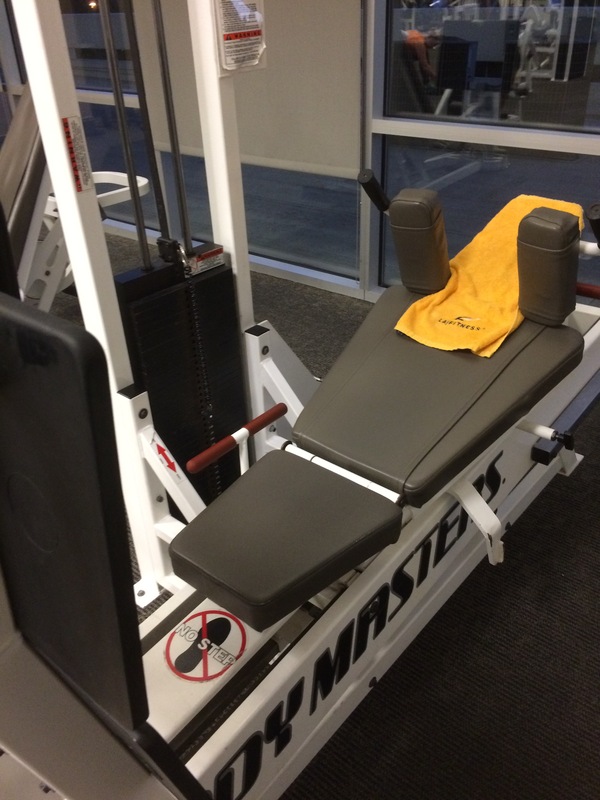 On this machine, I completed 1 set of 25 reps using 70lbs of resistance. Then, 2 sets of 25 reps using 80lbs of resistance. I finished with 1 more set of 25 reps at 70lbs. Just like the chin up/dip machine, the weights were about right. I initially had thought of doing 4 sets of 25 reps on 70lbs of resistance. However, once I got into the first set, I realized that 70lbs wasn’t very challenging. So, I made the switch up and it worked. My last machine is the leg press machine. 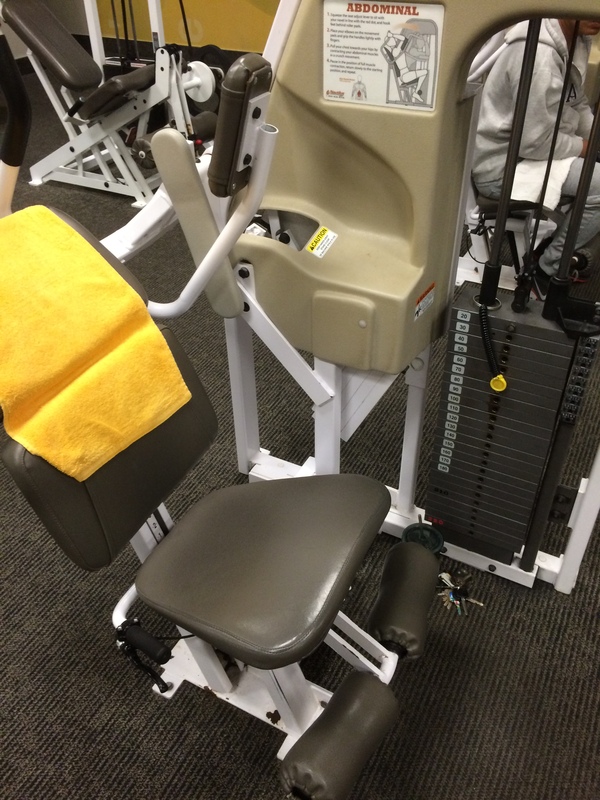 On this machine, I completed 2 sets of 25 reps with 170lbs and 2 sets of 25 reps with 180lbs. Again, this seemed perfect right from the first set. 170lbs was slightly challenging and 180lbs pushed me a little bit but was very doable. 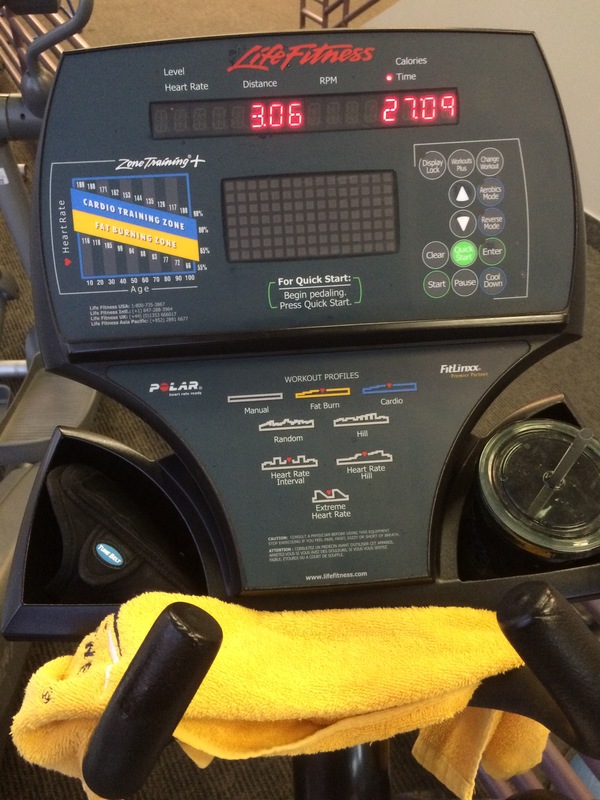 I finished the workout off with 27 minutes on the elliptical machine. I don’t think that elliptical machine miles are equal to treadmill miles. However, I completed 3.41 miles in the 27 minutes. With the elliptical machine, I start off by going forward for 15 minutes. Then, I spend the last 12 minutes backpedaling. I only used a 1 level of resistance because it’s been so long since I was on this machine. Also, keeping with the laying a foundation for future greatness theme of the week, it seemed like a good place to start. I was correct. Creating Awesome doesn’t happen overnight. I realize that this is merely week 1 of 17 to get me ready. The focus for week 2 is maintenance. I’ll keep the same intervals in my running as I did in week 1. In week 3 is where I’ll start to tighten up the screws. One thing I’m super stoked about is that I finally got back to 4 workouts in ONE week! I once heard Meb say that the key to long distance running is patience. There is a lot of learning how to hold back and knowing when to strike. Before I did races, I ran on a treadmill to loose weight. It was a totally scary thing for me to do. However, I started off with trying to run 400 meters (1 lap on the treadmill). I did that for 2 weeks. Then, I added a second lap for two weeks. I continued that pattern until I got up to 3.10 miles. From there, I started increasing the speed I would run at on the treadmill. 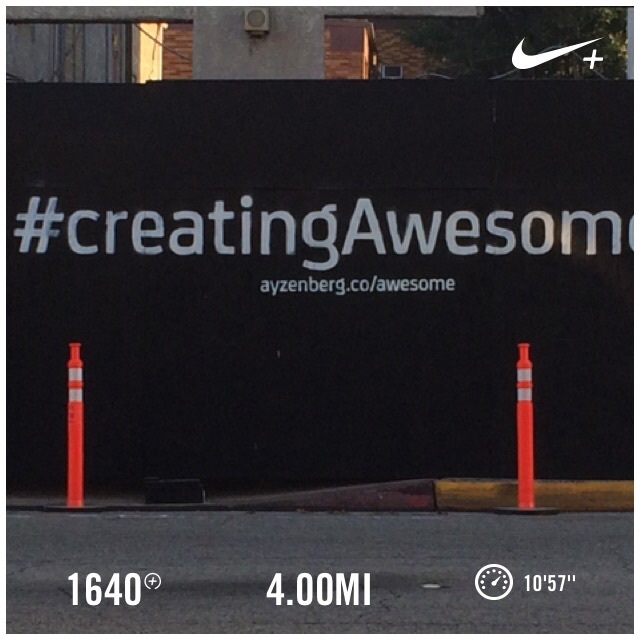 I worked my way up to finishing 3.10 miles at 6.8mph. I think that by making those gradual increases every two weeks is what will work for me. 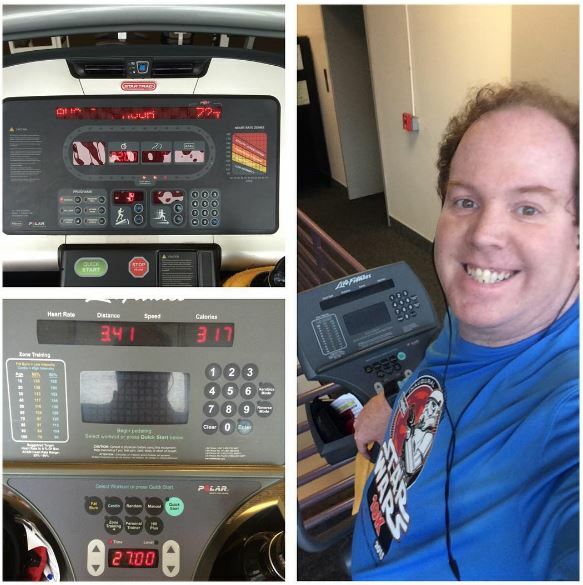 I’ve started training for the Rock n Roll San Diego Half Marathon with a 2:35:00 time goal. By the time April rolls around, I’ll have a much better idea of what I’m capable of. This training cycle is the Jeff Galloway cycle for time improvement. With the track workouts and treadmill time, I think I’ve got a real shot at this time goal. It would be a pretty good PR for me if I get it. 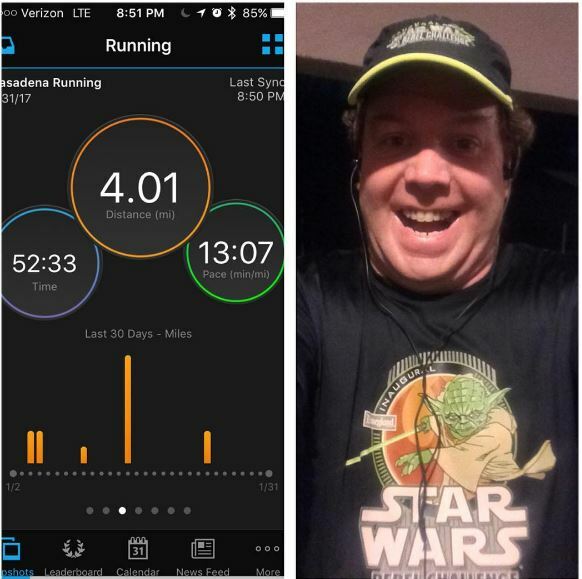 For those interested, one year ago, I ran 4 miles and 3 miles faster than I did this year. However, I only got 2 workouts in for the week. 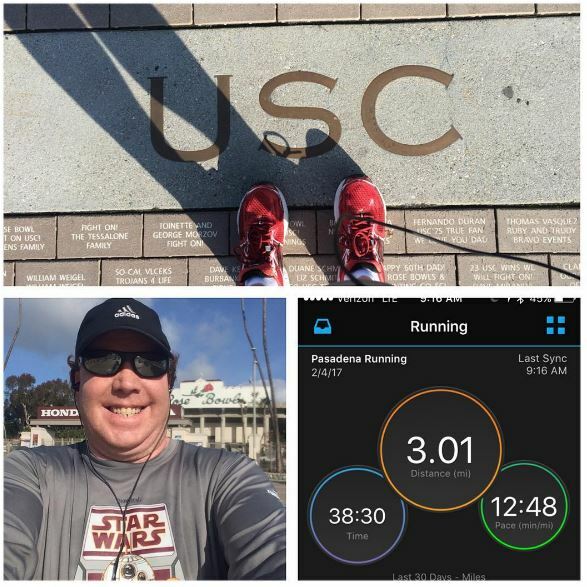 It was 1 mid-week 4 mile run and 1 weekend run around the Rose Bowl loop. So, the very fact that I made all 4 this week is a very good thing and gives me confidence heading into week 2! It’s time to build some consistency!